Beautiful home on desirable corner lot in quiet cul-de-sac and NO HOA FEES! 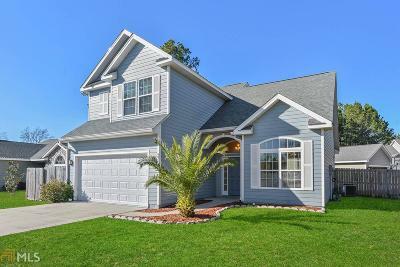 Large kitchen is equipped w/ granite counters, glass back splash, stainless steel appliances, upgraded cabinets, tiled flooring & TONS of pantry space! Master suite and master bath w/double vanity sink & custom tiled walk-in shower on main floor. 3 bedrooms and full bath w/ shower/tub combo, & additional storage closet on 2nd floor. All bedrooms have their own walk-in closets! This home is full of spectacular features: AMPLE STORAGE, water softener, foam insulation for energy efficiency, and fenced yard w/ fenced storage for trailer, boat, or RV! Secluded yet convenient location to Kings Bay , NAS Jax, & Mayport naval bases! House appears to be larger than tax records indicate. Directions: In Kingsland West Of The Intersection Of Hwy 40 & Hwy 17, Turn Off Hwy 40 Onto Sheffield St. Turn Right Onto Sherard Ave W. House Is At The Intersection Of Sherard Ave/Hideaway Lake Dr And Gladden Ct. Look For Sign In The Yard.